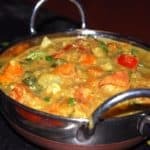 Navratan Korma is a delicious mixed vegetable curry that's finished with some smooth cashew cream. 1/2 cup cashew nuts , soaked in about 1 cup of water for about half an hour and then ground into a fairly smooth paste (I like a few bits of cashew in there but you could grind it very fine if you prefer). In a saucepan, heat the canola oil. Add the onion and stir occasionally until brown spots appear. Add the ginger and garlic and stir another minute. Do not let them burn. Add the powdered spices and stir until coated with oil and lightly toasted, about a minute. Now add the tomatoes and turmeric and cook, stirring, until the tomatoes break down. Add the soy yogurt and let the paste cook for another 2-3 minutes. Add salt. When the gravy comes to a boil, turn down the heat and simmer on a low flame for another five minutes for the flavors to incorporate. Add the pineapple rings and cashewnut paste and heat until just warmed through.